Capping off a nailbiter late-night session, a stripped-down version of a bill to repeal the Affordable Care Act failed in the Senate 49-51, with Arizona Sen. John McCain splitting from fellow Republicans to cast the deciding vote. The vote on the so-called “Skinny Repeal” came just after 1:30 AM ET, following hours of efforts by GOP leaders, including Vice President Mike Pence, to convince Republicans, like Maine Sen. Susan Collins and Alaska Sen. Lisa Murkowski, to vote yea. Neither budged, and in the end the effort concentrated on McCain, who, as it happens, on Tuesday helped make early Friday’s vote possible. He left the hospital where he is being treated for aggressive brain cancer to vote in favor of bringing various Republican health care bills to the floor for debate. Throughout the night, broadcast live on C-SPAN2, Senate Majority Leader Mitch McConnell and Pence could be seen speaking to McCain, often heatedly. It was unclear what was said between the men, but at one point Pence left the Senate building outright, only to return half an hour later, just before voting began. There was speculation from observers that McCain’s final vote wasn’t clear even to his party colleagues, and given the reaction by Senate Democrats, that seems plausible. Democrats gasped, while McConnell looked inconsolably angry. On Wednesday, the Senate held two votes — one for a repeal-and-replace option, and one for a repeal-only option — but both failed. McCain voted for these bills despite having said earlier in the day he would not, sparking confusion along with not a little condemnation. Had “Skinny Reform” passed, it would have been by a slim margin. The 48-member Democratic caucus was firmly opposed, and Murkowski and Collins reliably voted with them. In fact, the measure Wednesday to bring bills to the floor for debate passed only with Vice President Pence casting the tie-breaking vote. The bill exposed division in the Republican Party. 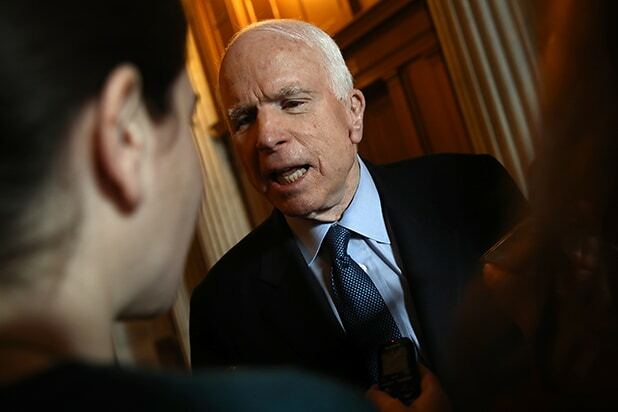 McCain’s vote saved legislation passed by President Obama, who beat him in the 2008 presidential race, and defied President Trump, who once mocked McCain for being captured while serving as a Navy fighter pilot in Vietnam. Texas Rep. Blake Farenthold was so angry about female senators who opposed an earlier GOP bill that he said on July 21 that were they men, he would challenge them to a duel. Recent polling shows Americans are by and large strongly opposed to repealing Obamacare, with just 19 percent in favor as of July 19. Unsurprisingly, that’s reflected on social media, with Twitter breathing a collective sigh of relief — and engaging in a very cautious victory dance — after the Republicans’ latest efforts to take health care away from millions failed. See a sampling below. Mitch McConnell is really crying because he didn't deliver the #SkinnyRepeal & the Dark Overlord now gets to collect his soul.